Bolts & beams under way. The locking block & tackle was quite helpful. The train was one of our most ambitious treehouse projects ever, due to the size and the creative designs of each of the cars. The design process was guided by what we wanted Treehouse World visitors to see when they pulled into our parking lot. We had a line of trees that we wanted to use originally where people would walk under one of the train cars on a pathway, but this would have left half the train much less visible. We also investigated and found 2 of the trees on that side were not healthy. As a result, we pushed the train forward and used a red oak at the front, and used some utility poles to support the 34' span from water tanker to the engine. Each car was designed with a theme in mind and character of it's own. The logs on the log car are held in place with a custom steel frame bolted down to the floor. They hold the logs in a staggered pattern to make it more opaque. We needed a tunnel to walk through, but wanted the appearance from the outside that it was just a big stack of logs. The circus car needed hay bales and bars on the windows to keep the little monkeys inside. The coal tender needed a roof hatch for future expansion (would like to add a bridge from the top some day...) And of course, the engine needed an authentic steam whistle for kids to pull. Treehouse World offers workshops every year to teach people how to design and build treehouses. These workshops are open to parent/child teams, contractors, tree climbers, architects, or anyone interested in learning our craft. A small group of 10-20 people gather from all over the world to meet like minded people and learn some new tricks. For a 2-day experience of learning both hands on and in a classroom, check out our Treehouse Construction Workshops! We get many requests from people who want to build their own treehouse or hire us to build one for them. Treehouse World does not do this, but our affiliate companies do. 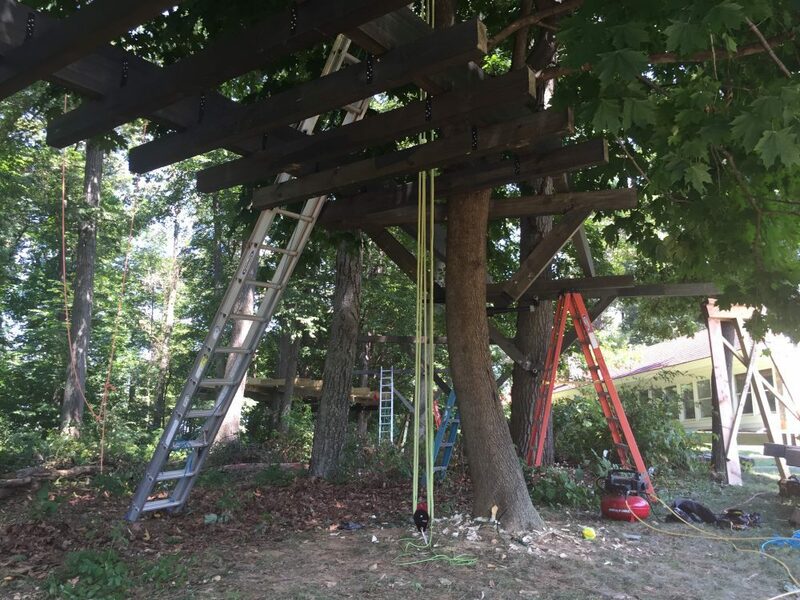 For construction of commercial and residential treehouses, please visit Tree Top Builders, Inc. For buying a kit or plans to install a treehouse yourself, please visit Treehouse Supplies, Inc.